Jasmyn Phillips is one of our talented female dronists and also a top pilot on Dronestagram! We wanted to know more about her passion for aerial photography and how she sees the biggest challenges for female drone photographers. I spend most of my time on the beautiful and majestic west coast of Canada. I live on Vancouver Island with my loving husband and our cat, Muffin (don’t let his cute name fool you, he’s a tough kitty, just like me, haha). When I retired from finance a number of years ago due to health issues, I realized I needed to bring my life back into balance. I love the ocean, fresh air and being outdoors as much as possible. I love to use photography to communicate important issues that affect the natural world around us. Finding my roots was how to start my journey to recovery. I grew up always playing outside for hours upon hours. So now I am a nature photographer that specializes in wildlife portraits. It started out as a therapeutic hobby and developed into a love of sharing our wonderful world through pictures. I am also very passionate about conservation and the environment and I believe we have a responsibility to care for our planet. Moreover, I enjoy traveling at any opportunity and a favorite place is the Salton Sea in Southern California. I visit twice a year to photograph the incredible variety of birds that stop there during migration. A couple of years ago while I was photographing birds at the Salton Sea, I remember seeing a man flying a quadcopter down on the shore. I had been trying to get a good shot of some pelicans on a sandbar and feeling frustrated because they were far away. I knew if I came too close they would take off. Then to my amazement, I watched as the man flew his quadcopter right over the pelicans. The birds seemed completely undisturbed. I suddenly realized how fantastic it would be to photograph from a whole new perspective, a bird’s eye view. From that moment on I knew I wanted a drone. About a year later I became friends with another Salton Sea advocate, Eric Hanscom. I also discovered that he flew drones quite frequently. He posted many aerial shots from when he and his family visited interesting places. I was constantly in awe of his work. One day Eric asked me if I had ever thought of getting a drone. Of course I answered that I had thought about it (little did he know that my obsession with drones had already taken flight). He offered to teach me to fly the next time we were both visiting the Salton Sea. Well, I was absolutely thrilled! As we all know, Eric is the #1 Top Pilot on Dronestagram. I was stoked to be learning from the best and I truly appreciated his kind offer. I could hardly wait for my next trip to California. Yes, it was a very intense experience. A group of us drove down to my favorite place at the Salton Sea. Huge gusts of wind swirled around us as we stepped out of the car. This was not unusual for the desert but it was certainly less than ideal for piloting a drone. Then, the moment I had been dreaming of for nearly 2 years became a reality. It was wonderful to feel the drone respond to my fingers on the joystick. Eric however was confident that the Parrot Bebop could handle the blustery conditions. Within minutes everything was set up and ready for take off. Eric took the drone up first and we all watched as he expertly maneuvered it in flight. The robust little Bebop 1 cruised and hovered defiantly in the turbulent air. Then, the moment I had been dreaming of for nearly 2 years became a reality. It was my turn to fly! I felt elated and apprehensive as Eric handed me the SkyController. It was wonderful to feel the drone respond to my fingers on the joystick. But as the wild wind lashed, it stung my eyes and whipped my hair across my face. The glare from the sun made it almost impossible to see the screen on the SkyController. As unfavorable as the conditions were I focused intently on the drone. I really enjoyed the Bebop’s sturdy design and reliability. I moved it up and down the shoreline of the Salton Sea and took my very first dronie. Despite all the challenges I truly loved flying drones. For the moment I fly the new Yuneec Breeze and I absolutely love it! I actually won it when I attended InterDrone in Las Vegas in September and I remember the first time I saw it at the Yuneec booth. 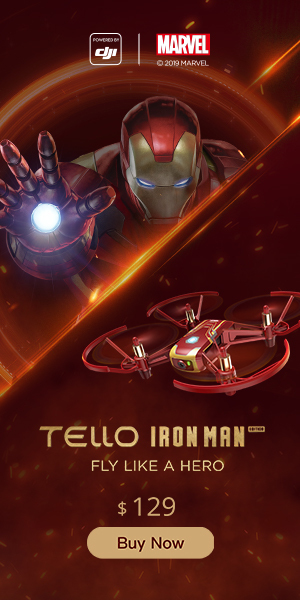 I was thinking, I would really enjoy flying it, this is the perfect drone for me. What I love most is that it is light, compact and easy to take wherever I travel. When I picked it up at the post office after Yuneec sent it out to me, I thought, can it really be all in this little box? I almost wanted to ask if there was another package waiting for me. As I opened the box I was pleasantly surprised to find everything neatly contained and stylish. It fits conveniently in my backpack with spare room for the charger and a fold up take off/landing pad. As I am often on the go in all sorts of terrain, I have no trouble taking it with me along with my camera bag and mini backpack. I have also flown the Bebop 1 and 2 and DJI Phantom 4 Advanced. For my cameras, I use a Panasonic Lumix because it has a great lens for various photography but my ultimate favorite is my Nikon that has a super zoom lens. Being a wildlife photographer, I need it to get me close without being directly in their space. It is always the camera that I take with me on my travels. What are your views on the FAA and how they have been dealing with UAVs? I feel it is important to have regulations from a central place of reference to encourage consistency and clarity. I also think its a progression that will take time to work things out, but that is to be expected. However I have a young friend who is not too happy about the new age requirement. I often fly drones with Eric Hanscom and his family. His son Martin is 10 years old and he is an excellent dronist. He has amazing skills and ability when piloting a drone; I’m always very impressed when I see him fly. Just recently we were using Parrot’s new FPV googles and Martin flew with such precision and care. I am always inspired by him. Sometimes I feel that age is just a number and not always a true reflection of maturity and judgement. Martin proves himself every time to be a great pilot. What are the biggest challenges for female drone photographers in this male dominated environment? It is easy to feel alone, ignored or even isolated when it seems very few women share our interest. At times wonder if women are given the same recognition or opportunities as male pilots. However my attitude is, no matter what the obstacles may appear to be I will always work hard to better myself, for myself. My focus is to improve as much as possible because drone photography is something I enjoy doing whether I feel alone in it or not. It is encouraging that Dronestagram has a number of women participating on the website. I’m thrilled to be the first female in the Top Pilot ranks. It’s also wonderful that Dronestagram is publishing articles on women who fly drones. In what ways do you think that drones could revolutionize or innovate things like commercial use and research? I see drones providing a huge advantage for nearly every industry. They are certainly creating new advertising and media opportunities. I have a friend who use to be a cinematographer. He was telling me about his experience of hiring a helicopter to shoot scenes from the air. The cost was immense at $1000/hr. Thanks to drones, aerial shots are now easily within reach and much more convenient and affordable. When it comes to research, that is something I am very interested and excited about, especially in regards to ecology and conservation efforts. Drones already help us monitor environmental conditions, safely collect data from remote or hazardous locations and keep track of wildlife populations just to name a few benefits, while also saving time, money and manpower. I believe drones will take us above and beyond however we choose to advance. I’m involved in documentation and study of Salton Sea water levels, wildlife habitat and vegetation management. At the end of this month, I am assisting Eric to train State officials to fly drones to help with that research. We saw that many of your pictures come from Salton Sea and Owens Dry Lake in California. Is there any reason why these locations (any project going on)? Yes, these areas are facing critical public health, environmental and economic challenges. I’ve already touched briefly on some of the ways I’m involved at the Salton Sea. It is California’s largest lake and it is also in danger of drying up and becoming a source of hazardous dust storms, similar to what has been experienced at Owens only on a much bigger scale. I have been coming to the Salton Sea since I was a child and it is a very special place to me. I feel a strong desire to help preserve it in any way that I am able. The photography is a powerful way to raise awareness and document significant changes as the shoreline rapidly recedes. Taking aerial photos using drones has proven to be a very valuable and effective tool for these projects. I also volunteer my time with a non-profit group called The EcoMedia Compass that is intensely involved in educational outreach about the plight of the Salton Sea. They have possibly the world’s most extensive library of Salton Sea aerial images and drone footage. I think that is pretty impressive! What is your favorite shot and why? My favorite shot is a recent one I took while we were filming a documentary about California’s lakes. For a while now I have wanted to see Owens Dry Lake in the Eastern Sierra Mountains. Prehistorically, Owens Lake was a massive body of water. But over time it was drained and by the early 1900s the Los Angeles Aqueduct diverted its water and the lake was desiccated. It has been a huge source of fugitive dust for many years, severely impacting people’s health. In early 2000s dust control projects have been in place to mitigate the issue. Because we are facing a similar situation at the Salton Sea, I felt strongly about not just reading about Owens Lake but witnessing it firsthand. I was amazed at the extreme natural beauty of Owens Valley and the surrounding desert. I imagined how fantastic it would have been with a stunning blue lake reflecting the mountains, clear skies and colors of sunsets. However the reality of what it is now is very different. It is a constant construction project where various dust abatement methods and land art are installed to quell the effects of the devastation. I flew my drone over a spot of particular interest to me – where the red water of the salt brine ponds met the smooth blue sky and the hard packed brown earth lay in perfect rows and swirls of soil. It was a marvelous contrast of color, pattern, harmony and disparateness. It is a memorable and impactful image that is beautiful yet sobering at the same time. I love to read, whether it is a fictional story that transports me to another time and place, or researching and learning about the natural world around me. Recently I discovered a love of designing jewelry. One summer after my camera fell in the ocean (I felt like my world had come to an end), I desperately needed another creative outlet. I had previously made a pair of dolphin earrings for a friend and decided to try my hand at it again. To my delight it was just the right thing to fill that void until I got a new camera. I also enjoy doing my own nail art, writing, hiking, 4x4ing with friends. Very important too, is visualizing future goals but also taking a little time to daydream about good memories. What piece of advice do you have for any drone photographer? My advice is practice, practice, practice. It is also important to be well educated about drone regulations, respect others’ privacy, use the buddy system when flying, be conscientious and always use common sense. We want to represent drones in their best light. And most of all, remember that success starts with a great altitude! Next Article Meet Felipe Lima, the Winner of the Yuneec Breeze Contest!